Allen & Heath digital consoles were a big hit with the bands and fans once again at this year's South by Southwest (SXSW), one of the world's largest annual music conferences in Austin, TX. The conference, which has been produced since 1987, is celebrated around the world as one of the great institutions of independent music. About 49,000 attended this year's tradeshow (March 12- 17); a mix of record labels, bloggers, booking agents and radio programmers. In addition, tens of thousands more crammed the streets, bars and restaurants of downtown Austin - all in search of the next cool thing. Threadgills is a favorite Austin hangout where rockers and rednecks rub elbows. The club is the epitome of what breathes life into the city's slogan, Keep Austin Weird. Credited as the joint where Janis Joplin perfected her brassy style, Threadgills is one of the busiest venues in Austin, especially during SXSW. The venue was outfitted with an Allen & Heath GLD-80 digital mixing system, fully loaded with the AR-2412 audio rack' two AR-84 expanders and full iPad integration. Most of the acts including Bob Schneider, West Water Outlaws, The Lost Brothers and James McMurtry were mixed on the GLD. Headliner and veteran country rocker, Shooter Jennings, was mixed on a pair of iLive T-112s by local production company Leo Sound from Elgin,Texas. The fast pace at SXSW is quite chaotic. Many music industry dealmakers are in attendance so the pressure is on the bands to have a hot set that could launch a successful career. That can be a nightmare for a sound engineer trying to dial in a great mix on an unfamiliar console. On the last day of SXSW, 18 acts took the stage at Threadgills between 11 a.m. and 7 p.m.
"It's not unusual for a band to have only have 10 minutes to set up and 20 minutes to play before the next band comes on. Thanks to the flexibility and intuitive nature of Allen & Heath's digital consoles, they are a perfect fit for the SXSW environment," explains Michael Palmer, vice president of sales, Allen & Heath. "I've had engineers with no prior experience on digital consoles, have an easy time navigating the system and producing the sound they want." 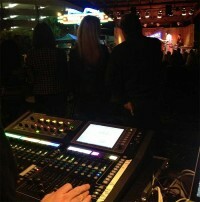 In picture: Allen & Heath GLD80 managing FOH duties at Threadgills, SXSW 13.